Welcome to the Southeast Climate Adaptation Science Center’s January 2019 Newsletter. For news and upcoming events related to the Southeast Climate Adaptation Science Center, subscribe to our monthly newsletter. Southeast CASC staff and investigators at NC State and Consortium universities are continuing the work of the SE CASC during the shutdown of the Federal government. Global Change Fellows have organized the Spring Global Change Seminar Series, which will cover topics related to sea level rise such as the mechanics, impacts, human stories, and adaptation. First in the series is Current State of Sea Level Rise in North Carolina, being held on Feb. 7, 3:30 pm in 101 David Clark Labs, NC State campus. Remote connections are available. See details at bit.ly/StateofSLR. Summaries and recordings of the Fall Global Change Seminars are available on our website: Fire Management Under Climate Change and Food and Water Security in the Face of Climate Change. New web post: Graduate student Melody Hunter-Pillion describes her work on facilitating oral history interviews in the field with scientists from Puerto Rico and US Virgin Islands as part of the Caribbean Oral History project, Gathering Oral Histories of Drought and Extreme Weather in the Caribbean. 2016-17 Global Change Fellow Paul Taillie and Faculty Affiliate Chris Moorman published an article, Marsh bird occupancy along the shoreline‐to‐forest gradient as marshes migrate from rising sea level, in Ecosphere. They found that marsh birds were less likely to occupy areas closest to the interface where coastal marsh communities have recently shifted landward toward coastal forest as sea level rises, and identified prescribed fire as a tool to increase the quality and quantity of habitat for coastal marsh birds in areas of marsh migration. Living Planet Report 2018 is the twelfth edition of World Wildlife Fund’s biennial publication. The report describes drivers, stressors, and threats to earth’s vertebrate biodiversity. Calculated Living Planet Indices (LPI) show the average rate of change over time across a set of species populations. These populations are taken from the Living Planet Database, which contains information on more than 22,000 populations of mammals, birds, fish, reptiles and amphibians. The global LPI, based on just over 16,700 of these populations, shows an overall decline of 60% in the population sizes of vertebrates between 1970 and 2014. Learn more. Climate Signals is a digital science platform that maps recent events and impacts related to climate change. This connectivity program identifies the relationship between greenhouse gas emissions and user-selected climate-related events (ie. hurricanes, wildfires, coral bleaching, etc.). The data are drawn from a relational database of events which allows the platform to create a “signal tree” that graphically displays the the long-term projection of climate change in relation to a specific climate event. Currently in open-beta release, it is developed by Climate Nexus, a non-profit organization that supports communications about climate change and clean energy. Learn more. Making Climate Assessments Work is a product of the National Academies of Sciences, Engineering, and Medicine’s two-day workshop entitled “Making Climate Assessments Work: Learning from California and Other Subnational Climate Assessments”. Subnational organizations continue to produce climate change impact reports to share with their stakeholders of how to prepare accordingly for the effects of climate change. This publication provides a summary of the discussions that took place at that workshop. Read the report. Living Shorelines Academy is a partnership between Restore America’s Estuaries and the North Carolina Coastal Federation that provides information and training for property owners and contractors on how to sustainably control erosion along estuarine shorelines. The protection techniques rely on native plants to reduce erosion, trap sediment, and filter runoff while maintaining a healthy coastal wetland habitat. The academy offers a number of additional resources to advance the policy, science, and practice of these at-risk ecosystems. Learn more. Linkage Priority Tool. This newly released version estimates and maps the relative priority of wildlife linkages in a region based on the weighted combination of ten considerations, including climate change. It is part of Linkage Mapper, a GIS toolbox designed to support regional wildlife habitat connectivity analyses. Developed by Conservation Biology Institute, it consists of several Python scripts, packaged as an ArcGIS toolbox, that automate mapping of wildlife habitat corridors. Learn more. Water-Quality Changes in the Nation’s Streams and Rivers. In an effort to protect and sustain our water resources, this interactive mapper displays stream trends in water chemistry and aquatic ecology for four time periods. The viewer can choose to investigate certain constituents by concentration or load in a certain area during a specific time period. Learn more. Urban Adaptation Assessment, an interactive database funded by the Kresge Foundation and led by the Notre Dame Global Adaptation Initiative collates a rich dataset within a visual platform to give leaders the data they need to make decisions on how best to adapt and prepare for climate-change impacts. Learn more. The 2018 Prescribed Fire Use Survey Report from the National Association of State Foresters and the Coalition of Prescribed Fire Councils is now available. Conducted every three years, this year’s report documents a 12 percent decrease in the use of prescribed fire on forested acreage nationwide since 2011. More information. The IUCN SSC guidelines for assessing species’ vulnerability to climate change is a document that was created to assist practitioners in carrying out climate change vulnerability assessments (CCVA) of species. The related literature is inconsistent and lacked a direct outline of how to carry out a CCVA. This paper summarizes the main approaches, measurable objectives, and common methods to provide a more comprehensive guide for conservation managers. More information. An assessment of the impacts of climate change on Puerto Rico’s Cultural Heritage with a case study on sea-level rise. This study conducted a spatial analysis and vulnerability assessment of the 1185 cultural heritage sites in Puerto Rico. Their results revealed that 27 sites are currently submerged during high tide. As sea levels continue to rise, researchers predict that by mid-century, 56 sites will be inundated and by the end of the century, 140 sites will be affected. As these are conservative estimates and numerous cultural heritage sites lie within close proximity of the high tide line, this paper highlights the pertinent need for conducting vulnerability assessments and developing subsequent adaptation strategies to protect cultural heritage sites. Link to article. Holding steady: Little change in intensity or timing of bird migration over the Gulf of Mexico. 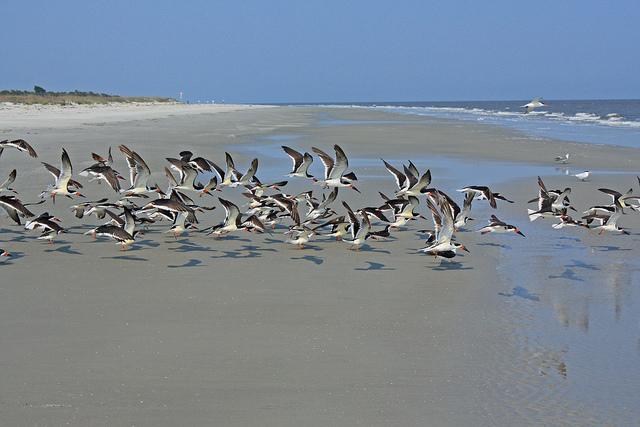 A new study combining data from citizen scientists and weather radar stations is providing detailed insights into spring bird migration along the Gulf of Mexico and how these journeys may be affected by climate change. Findings on the timing, location, and intensity of these bird movements have been published. Link to article. How fast are the oceans warming? Heat trapped by greenhouse gases is raising ocean temperatures faster than previously thought, concludes an analysis of four recent ocean heating observations. The results provide further evidence that earlier claims of a slowdown or ‘hiatus’ in global warming over the past 15 years were unfounded. Link to article. Evaluating the effects of land-use change and future climate change on vulnerability of coastal landscapes to saltwater intrusion. Coastal plain regions are especially vulnerable to the threat of sea level rise as the saltwater can infiltrate freshwater reserves through surface or groundwater connections. Land-use changes, such as man made canals, ditches, and drains can intensify this threat on already vulnerable coastal landscapes. This study conducted a regional spatial analysis throughout eastern North Carolina and concluded that wetlands are most vulnerable to saltwater intrusion. Link to article. Global synthesis of conservation studies reveals the importance of small habitat patches for biodiversity. Journal Abstract. We undertook a global synthesis of the relationship between the conservation value of habitat patches and their size and isolation, based on 31 systematic conservation planning studies across four continents. We found that small, isolated patches are inordinately important for biodiversity conservation. Our results provide a powerful argument for redressing the neglect of small, isolated habitat patches, for urgently prioritizing their restoration, and for avoiding simplistic application of island biogeography theory in conservation decisions. Link to article. The ‘pause’ in global warming in historical context: (II). Comparing models to observations. Authors review the evidence for an apparent divergence between global mean surface temperature (GMST) and Coupled Model Intercomparison Project Phase 5 (CMIP5) projections during a period in the early 21st-century, in particular the heavily-reported claim that climate models over-estimated warming. They systematically compared temperatures and projections using historical versions of GMST products and historical versions of model projections that were available at the times when claims about a divergence were made. A variety of statistical techniques that corrected for problems in previous work were used to show that there is no robust statistical evidence for a divergence between models and observations during the time period. Link to article. Culturally Relevant Climate Change Adaptation Planning for Tribes and Tribal Partners. Traditional and indigenous knowledges and perspectives have not often been recognized in climate adaptation planning efforts focused on natural and cultural resources. This training will use the new Tribal Adaptation Menu along with the Northern Institute of Applied Climate Science Adaptation Workbook to integrate tribal and traditional values with climate adaptation planning processes. Feedback and discussion on the menu will be welcomed and encouraged. The workshop will take place from January 23 – 24th, 2019 at the Cloquet Forestry Center in Cloquet, Minnesota. Learn more. Tribal Clean Water Act Section 319 Competitive Grant Request for Applications. The Environmental Protection Agency is soliciting applications pursuant to Section 319 of the Clean Water Act from eligible tribes and intertribal consortia to develop and/or implement watershed-based plans and implement watershed projects that will result in significant steps towards solving Nonpoint Source (NPS) impairments on a watershed-wide basis. Eligible entities are strongly encouraged to submit applications that develop and/or implement watershed-based plans designed to restore NPS-impaired waters and protect waters from NPS pollution. Applications are due January 24, 2019. More information. The Robert Wood Johnson Foundation has issued a call for proposals for projects that improve community health and well-being, advance health equity, while also addressing climate change adaptation or mitigation. Eligible applicants include: Federally Recognized Tribes, State Recognized Tribes, and Indigenous organizations. Applications are due by February 8, 2019. Learn more. The Tribal Exchange Network Conference, originally planned for February 26-28, 2019, is postponed until further notice. For updates. 2019 National Tribal Public Health Summit Call for Proposals. The National Indian Health Board is accepting proposals for presentations that highlight evidence-based, best, wise, or promising practices developed in and for Tribal communities. Presentation categories include Health Promotion and Disease Prevention, Public Health Policy, Infrastructure, and Systems, Substance Misuse and Behavioral Health, Environmental Health and Climate Change, Emergency Preparedness and Emerging Issues in Public Health. The summit will take place May 13-15, 2019 at the Albuquerque Convention Center. More information. Southeast Regional Climate Center: Autumn 2018 Southeast Region Quarterly Climate Impacts & Outlook. Southeastern Association of Fish and Wildlife Agencies: National Wild Turkey Federation is Hiring for a District Biologist. Strategic Environmental Research and Development Program: Due to the current government shutdown, the due date for SERDP core pre-proposals is being extended to 2:00 PM ET, January 22, 2019. Find more webinar information in our calendar. Find more upcoming events in our calendar. In this workshop, staff from the Division of Coastal Management and North Carolina Coastal Federation will provide information about the benefits of living shorelines in North Carolina, discuss various living shoreline design options, how to permit these projects and an overview of best practices for creating living shorelines. The event is free and is specifically intended for marine contractors, engineers, landscape architects, land use planners, floodplain managers and other professionals. View the agenda or register here. The conference is a regular gathering of professionals to learn and exchange ideas, through a formal program, related meetings and other scheduled business, social and educational events. Attendees will gain a better understanding of the origins, complexities and likely solutions to current conservation issues, and a better sense of the need for and the methods to achieve coordinated, cooperative management of the continent’s wildlife. Register here. Citizen Science Association’s biennial conference is a rare place where people doing many different kinds of work come together to exchange ideas, meet collaborators and new mentors (or mentees), and overall be both challenged and inspired. CitSci2019, Growing our Family Tree, is all about broadening this citizen science community and providing a space where we can all share and learn together. This conference will explore the impacts of sea level rise on historic coastal and river communities and cultural resources through the lens of time. With the theme of Envision 2050, emphasis is placed on policies, programs, and projects that address the situation in the short-term (defined as 30 years). Presenters will share research, strategies, and case studies of real-world applications that will physically, socially, and economically transform the world as we adapt the world to sea level rise over the next few decades. This conference, organized by the Climate Adaptation Initiative at Columbia University’s Earth Institute, is an effort to address issues related to sea level rise and coastal flooding across the globe. The event will connect leaders from a variety of disciplines to advance the dialogue around sea-level rise science and policy. Those involved in policy, planning, or corporate foresight activities are invited to submit an abstract for presentation, due on February 1, 2019. NC Foundation for Soil and Water Conservation has opened the application period for the Careers In Conservation Scholarship Program. This program is dedicated to increasing the number of qualified individuals working in the field of natural resource management and related fields. Applicants must be a resident of North Carolina and have plans to attend a college in North Carolina. Applications are due at 5pm on January 31, 2019. Apply here. Warner College of Natural Resources at Colorado State University has a new position available for a tenure track Assistant or Associate professor focusing on Diversity and Inclusion in Natural Resources. Applications are due by January 18, 2019. Apply here. EcoAdapt is hiring an Associate Scientist for a full-time position in the Seattle, Washington metro area. The selected candidate will work closely with the State of Adaptation program, a research initiative designed to raise awareness of and build capacity for on-the-ground climate adaptation action. Applications are due by 5pm on January 28, 2019. More information. National Academy of Science Gulf Research Program has opened the application period for the Early-Career Research Fellowship. This fellowship aims to support emerging leaders in the field as they research unique, untested ideas and collaborate among a greater network of colleagues who are also aiming to improve offshore energy system safety and enhance the welfare of coastal ecosystems and communities. Applications will be accepted through February 20, 2019. More information. National Fish and Wildlife Foundation and the Wildlife Habitat Council are requesting proposals for the Five Star and Urban Waters Restoration grant program. This program seeks to develop community capacity to sustain local natural resources for future generations by providing modest financial assistance to diverse local partnerships focused on improving water quality, watersheds and the species and habitats they support. Proposals are due by January 31, 2019. More information. National Fish and Wildlife Foundation Longleaf Stewardship Fund 2019 is soliciting proposals to expand and enhance longleaf pine ecosystem restoration and management across longleaf pine’s historical range, as well as the restoration and enhancement of bottomland hardwood forests within priority focal areas. Proposals are due on February 7, 2019. More information. The Environmental Justice Small Grants (EJSG) Program provides funding directly to community-based organizations for projects that help residents of underserved communities understand and address local environmental and public health issues. In general, the EJSG program awards grants that support community-driven projects designed to engage, educate, and empower communities to better understand local environmental and public health issues and develop strategies for addressing those issues, building consensus in the community, and setting community priorities. Applications are due February 15, 2019. More information. Mississippi-Alabama Sea Grant Consortium (MASGC) is pleased to announce a request for pre-proposals for 2020-2022 research funding. In this competition, MASGC will welcome projects in the following focus areas: Healthy Coastal Ecosystems, Sustainable Fisheries and Aquaculture, Resilient Communities and Economies, and Environmental Literacy and Workforce Development. A review of MASGC’s 2018-21 Strategic Plan describes the strategic direction for this funding announcement. Proposals are due by February 15, 2019. More information. North American Wetlands Conservation Act (NAWCA) grants increase bird populations and wetland habitat, while supporting local economies and American traditions such as hunting, fishing, bird watching, family farming, and cattle ranching. Wetlands protected by NAWCA provide valuable benefits such as flood control, reducing coastal erosion, improving water and air quality, and recharging ground water. The NAWCA program provides matching grants to wetlands conservation projects in the United States, Canada, and Mexico. There is a Standard and a Small Grants Program. First cycle grants are due February 22. Learn how to apply. Thriving Earth Exchange asks all scientific partners to work with a community to help define a project with concrete local impact that they can contribute to as pro-bono volunteers and collaborators. Hurricane Maria made landfall in Puerto Rico on September 20, 2017. One year later, the impact of landslides caused by the hurricane, directly or indirectly, on roads, bridges and private properties, continues to be a concern and a matter of urgency. This project seeks to source a number of volunteer Geologists to conduct more than 185 landslide inspections and reports, across 21 municipalities, on homes deemed to be in imminent danger of landslides. Learn more.